I can't believe a month has passed since my last entry. Time certainly seems to move right along these days. And there's not much time for finding records or, more importantly, sleep! Anyway, tonight, I'm having a bit of a trip down memory lane. Back when you would trade cassettes of 45s and LP tracks with your friends. That's where I first heard Howard Tate's "How Come My Bull Dog Don't Bark". A friend made me a tape of soul, r'n'b, jazz 45s. And it was quite an eye(ear? )-opening experience. Well, last month I was able to upgrade my copy, and also had the pleasure to remember what a great record this is. I must have played it 15 times the first night. 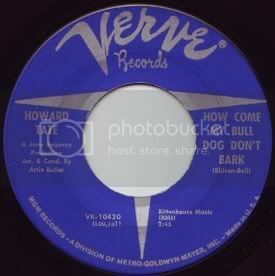 "How Come My Bull Dog Don't Bark" is a straight-ahead slice of r'n'b. Built on a strong, steady drum beat, there's some tasteful guitar and plenty of organ bubbling up. After the first chorus, the sax and horns come in, and then we really got a tune that makes you wanna dance. Even though the tune is about his woman possibly cheating on him, this tune always makes me feel good and puts a smile on my face. Apologies Mr. Tate. You can check this tune out (as well as other soul tunes) at Soulclub.